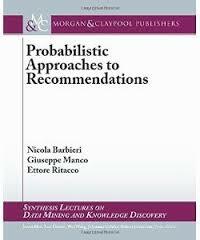 "This book starts with a brief summary of the recommendation problem and its challenges and a review of some widely used techniques Next, we introduce and discuss probabilistic approaches for modeling preference data. We focus our attention on methods based on latent factors, such as mixture models, probabilistic matrix factorization, and topic models, for explicit and implicit preference data. These methods represent a significant advance in the research and technology of recommendation. The resulting models allow us to identify complex patterns in preference data, which can be exploited to predict future purchases effectively. ..."